Home / Entertainment News, Media News / Diamond’s ex-wife, ZARI HASSAN, spits at hungry slay squeens who are chasing rich husbands after sampling expensive dicks. Diamond’s ex-wife, ZARI HASSAN, spits at hungry slay squeens who are chasing rich husbands after sampling expensive dicks. 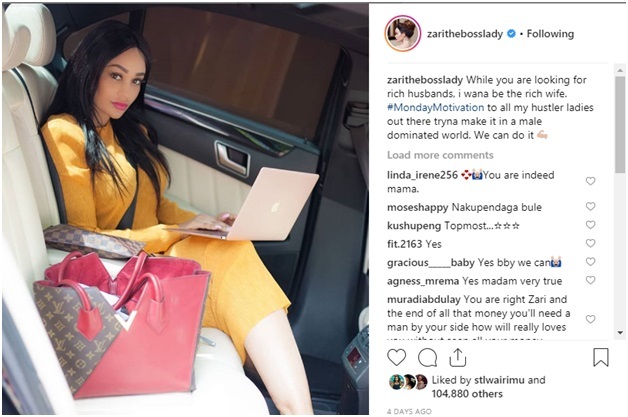 Thursday, February 7, 2019 - Diamond’s ex-wife and former Ugandan socialite, Zari Hassan, has lectured ladies who have been chasing moneyed guys and marrying them because of their deep pockets. In the past, Zari has been linked to several wealthy men like her late tycoon husband, Ivan Ssemwanga. The former socialite seems to have learnt a lot from her previous relationships with wealthy men and that’s why she is advising ladies to believe in themselves and work hard for their own money instead of chasing well oiled guys.